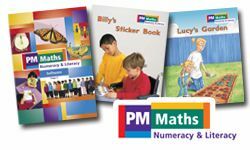 PM Math: Numeracy and Literacy is a collection of 48 Little Books that introduce key mathematical concepts to early readers. Side by Side: Literacy and Math is a unique series of levelled texts that connect language arts and mathematics through reading. Literacy strategies appear in meaninigful contexts and each book focuses on a different mathematics strand. Harcourt Math Readers builds literacy and numeracy together! Designed for students that are just starting out, Math to Learn presents basic math concpets in a simple-to-learn format. Lots of illustrations and clear explanations help students understand math concepts including numeration, addition and subtraction, money and time, basic geometry, measurement, graphing, and patterns. This comprehensive, yet user-friendly handbook provides clear explanations and numerous examples to help students understand important math concepts including basic operations, mental math and estimation, fractions and decimals, algebra and geometry, graphing, statistics, and probability. Math at Hand provides a resource for students in Grades 5 and 6 to find information on the math topics they're learning about - from mental math and problem solving, to graphing statistics and probability, to pre-algebra and geometry. A handy resource for junior high or middle school, Math on Call is designed to help students become more independent in researching and reviewing math concepts and strategies. Algebra to Go is a student-friendly resource that covers key and often complex math topics in a way that's clear and easily understandable for students - from numeration and number theory to estimation, linear and non-linear equations, geometry, and data analysis. Geometry to Go is the latest in the series of mathematics handbooks and it is packed with numerous examples, detailed explanations, easy-to-follow charts and graphs to help teach, reinforce, and review key concepts.